The Chandris Lines Memorabilia Slideshow. 1 An assortment of Chandris Memorabilia. The above slideshow images were supplied courtesy of Nick Vlahadamis. Nick Vlahadamis was neither a crew member nor a passenger of any of the Chandris liners. He does remember as an infant boarding the Patris to say farewell or greet a relative some time in 1969-70, on the Patris in Sydney. He is the son of a passenger who arrived in Australia on the Patris in Fremantle, Western Australia on the 20th. May,1963. Nick remembered him father-who passed away in 1985-speaking very warmly about his experience as a passenger on what was then a migrant ship. 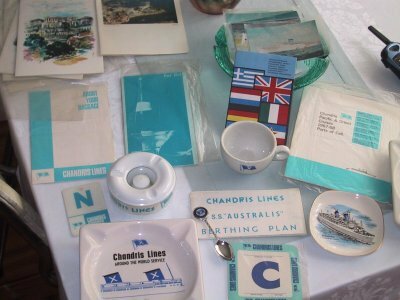 Nick stumbled on a Chandris lines ashtray in an old wares store in the tropical city of Cairns, Northern Australia some time in 1992. From then on his interest has snowballed. A visit to his fathers village in Greece (2000), Nick discovered photos taken by a friend of his father before he boarded the ship in Piraeus, and a photo of him involved in some type of mock play deck. Nick is 37 and fascinated by the stories of those who came from so far away to Australia, and those carriers who brought them here.